After 30 seconds 2 candles are lit. After 60 seconds 4 candles are lit. After 90 seconds 8 candles are lit. 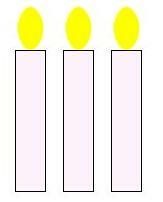 So every 30 seconds, the number of lighted candles doubles. So after 7*30 seconds 2^7 = 128 candles are lit. And after 8*30 seconds 2^8 = 256 could be lit. But were only 200 candles to start with. So in the last step some people will not find a candle to light. It will hence take 4 minutes to light all candles.